Republic Services, Inc. today reported net income of $77.3 million, or $0.58 per diluted share, for the three months ended September 30, 2006, versus net income of $63.8 million, or $0.45 per diluted share, for the comparable period last year. Net income for the three months ended September 30, 2006 included a $5.1 million tax benefit related to the resolution of various income tax matters. Revenue in the third quarter of 2006 increased 7.8 percent to $787.1 million from $730.0 million for the same period in 2005. Operating income for the three months ended September 30, 2006 was $133.4 million, compared to operating income of $119.4 million for the same period last year. For the nine months ended September 30, 2006, net income was $212.7 million, or $1.56 per diluted share, versus net income of $193.7 million, or $1.32 per diluted share, for the comparable period last year. Net income for the nine months ended September 30, 2006 included a $5.1 million tax benefit related to the resolution of various income tax matters. Revenue for the nine months ended September 30, 2006 increased 8.4 percent to $2,304.4 million from $2,125.8 million for the same period in 2005. Operating income for the nine months ended September 30, 2006 was $389.8 million compared to operating income of $361.8 million for the same period last year. "During the quarter, we continued to experience strong internal growth and saw our margins grow by 60 basis points," said James E. O'Connor, Chairman and Chief Executive Officer of Republic Services, Inc. "Based on the tax benefit, margin enhancement, and an expectation for favorable price and volume growth, we are increasing our earnings per share guidance for the year to a new range of $2.03 to $2.06 per diluted share. Normalized free cash flow is anticipated to be in the upper end of our guidance of $280 million to $290 million." 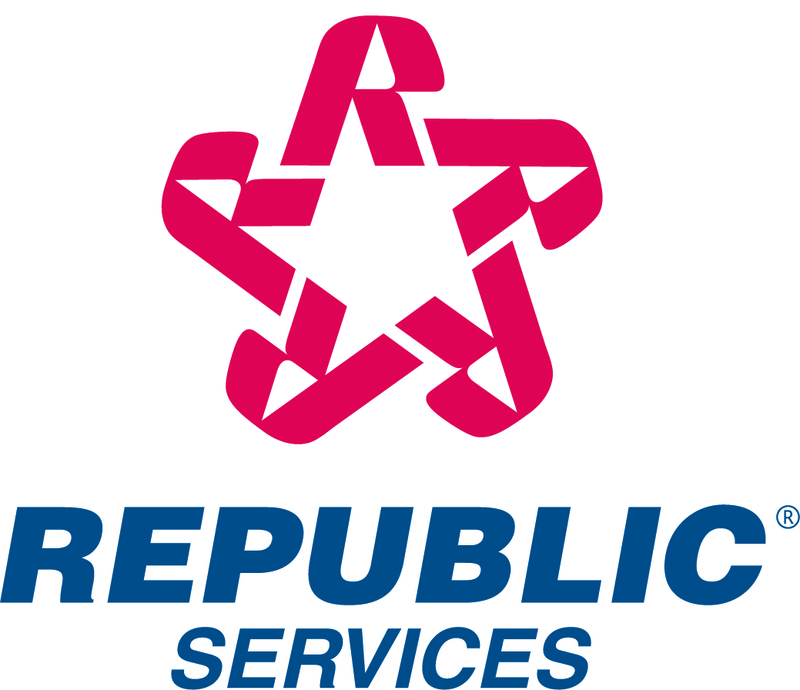 Republic Services also announced that its Board of Directors declared a regular quarterly dividend of $0.16 per share for shareholders of record on January 2, 2007. The dividend will be paid on January 15, 2007. During the three months ended September 30, 2006, Republic Services repurchased 2.3 million shares of common stock for $91.9 million. For the nine months ended September 30, 2006, Republic Services repurchased 10.4 million shares of stock for $417.7 million. Republic also announced today that its Board of Directors has authorized the repurchase of up to $250 million of its common stock. After Republic executes this $250 million stock repurchase program, the total amount of repurchased stock will exceed $2 billion since Republic's stock repurchase program began in 2000. The following information should be read in conjunction with the Company's audited Consolidated Financial Statements and notes thereto appearing in the Company's Form 10-K as of and for the year ended December 31, 2005. It should also be read in conjunction with the Company's Unaudited Condensed Consolidated Financial Statements and notes thereto appearing in the Company's Form 10-Q as of and for the three and six months ended June 30, 2006. The Company adopted Statement of Financial Accounting Standards No. 123 (revised 2004), "Share-Based Payment" ("SFAS 123®") effective January 1, 2006. Stock options granted prior to the effective date of SFAS 123® were fully vested as of December 31, 2005, and, consequently, no compensation expense will be recognized for these options. During the three months ended September 30, 2006, the Company recorded a $5.1 million net income tax benefit in its provision for income taxes. This benefit relates to the resolution of various income tax matters including the effective completion of the federal tax audit for years 1998 through 2000. The Company believes that its effective tax rate for the three months ended December 31, 2006 will be 38%. During the three months ended September 30, 2006, cash provided by operating activities was $154.0 million, cash used in investing activities was $29.8 million and cash used in financing activities was $105.6 million. During the nine months ended September 30, 2006, cash provided by operating activities was $300.8 million, cash used in investing activities was $176.4 million and cash used in financing activities was $206.9 million. Free cash flow for the nine months ended September 30, 2006 was negatively impacted by an $83.0 million federal tax payment for 2005 that had been deferred until February 2006 as a result of an Internal Revenue Service notice issued in response to Hurricane Katrina, and by payments made during the three months ended March 31, 2006 for capital and other expenditures incurred in 2005. The Company expects normalized free cash flow for 2006 to exceed 100% of net income. Normalized free cash flow excludes $113.4 million of federal tax payments and approximately $60 million of payments for capital and other expenditures that relate to 2005 that were made during 2006. Capital expenditures include $.8 million and $.7 million of capitalized interest for the three months ended September 30, 2006 and 2005, respectively, and $1.7 million and $1.2 million for the nine months ended September 30, 2006 and 2005, respectively. As of September 30, 2006, accounts receivable were $311.5 million, net of allowance for doubtful accounts of $19.4 million, resulting in days sales outstanding of approximately 35 (or 23 net of deferred revenue). During the three months ended September 30, 2006, the Company paid $91.9 million to repurchase 2.3 million shares of its common stock. During the nine months ended September 30, 2006, the Company repurchased a total of 10.4 million shares of its common stock for $417.7 million. As of September 30, 2006, the Company was authorized to repurchase up to an additional $73.5 million of its common stock under its existing stock repurchase program. In October 2006, the Company's Board of Directors authorized the repurchase of up to an additional $250.0 million of its common stock. In July 2006, the Company paid a dividend of $18.7 million to shareholders of record as of July 3, 2006. As of September 30, 2006, the Company recorded a dividend payable of $21.1 million to shareholders of record at the close of business on October 2, 2006, which has been paid. In October 2006, the Company's Board of Directors declared a regular quarterly dividend of $.16 per share for shareholders of record on January 2, 2007.